Expand your The Settlers of Catan game in new directions, add islands, pirates, gold, ships, and trade. Seafarers adds islands and shipping routes to travel between islands. Shipping routes (which look like ships) can be built with a sheep and a wood, meaning sheep become a lot more valuable and therefore balancing the resource values better. Shipping routes are slightly different to roads as you have both open and closed shipping routes. Shipping routes must start at a settlement on a sea bordering hex, i.e. you cannot have roads turning straight into a shipping route (Catan settlers have not invented the boat cart). A shipping route becomes closed when you have a continuous length of ships from one settlement to another. Whilst a shipping route remains open you can move the boat at the open end (not connected to the settlement), so you can change course if you so desire. Shipping routes act just like roads to use towards the longest road achievement. There is now a pirate (a black ship) as well as the robber which prevents boats from moving or being placed on the placed hex; when you roll a seven you can choose to move either the robber or the pirate (you still get to steal a card). Gold hexes are added which are a resource of your choice when they are rolled (a wild card). One of my favourite ways to play with Seafarers is to have a starting island where players place their starting settlements, then have the rest of the tiles hidden, to be flipped over once someone’s ship reaches that hex and then a mystery number is added from a number token pile or bag. There are many ways you can vary this sort of exploration gameplay and the game itself includes exploration scenarios. Anyone who enjoys Catan but wants to add more variety to the gameplay and change the map up a bit, allowing for exploration type scenarios. If you like Catan then yes, yes and yes! The only time I play without seafarers is when I am teaching people who are new to the game and want to teach them the basic mechanics first. The game can be combined with all of the other expansions but you need the base game to play. A 5-6 player expansion is also available for Seafarers. This is a must buy for any Catan fans and in my opinion is the best expansion. You get a lot more gameplay variety for your money and it is well worth a buy! Tip: With the release of edition 5, make sure you know which edition you are buying. Finally! The sheep is useful again. From the core game of Catan, there’s usually not much use for sheep other than trading in for other resources. That’s always been a shame, since all the other resourcer are so high in demand. Seafarers corrects this by adding ships. In order to build a ship you need sheep and wood. No more need for clay, in other words. And not only that, but ships can be moved from their location as long as they are not connected on both ends. And that’s another thing: islands! There’s a new tile type avaliable now: gold. Gold isn’t a new resource in the game, instead, it acts as a wildcard, where you may choose one of the existing resources instead. And reaching an island first grants victory points. It seems so little, at first. Boats. But it adds a lot more to the game, including several scenarios in the rulebook. Over half the content in the games rulebook are scenarios, in fact. If you want a new experience for Settlers, either try this, or Cities & Knights – my favorite of the expansions. I really enjoy Catan with this expansion. Some people say that it doesn’t add much to the base game, and I agree. However, what most people don’t know is that this game is what Catan was originally designed with Seafarers. So when you play Seafarers, you play Catan the way Klaus Teber originally designed it. When Catan was published, they cut out the boats and pirates to give it wider appeal, lower the complexity level, and lower the cost. I love the boats and the feeling of exploration. It really makes Catan more Civilization like, and really completes the game. The complexity doesn’t ratchet up too much with boats, which I like. It finally makes wool more useful. The one thing that I don’t like about Cities & Knights is that it completely changes the game I enjoy, but Seafarers only enhances the base game experience. I highly recommend it. This is the way I want to play Catan! After playing with this expansion I don’t think I will ever play just the base game again. Anyone who says that this expansion doesn’t add much is crazy. A couple of simple additions (mainly multiple islands and ships) open up a wealth of different options for gameplay strategies. 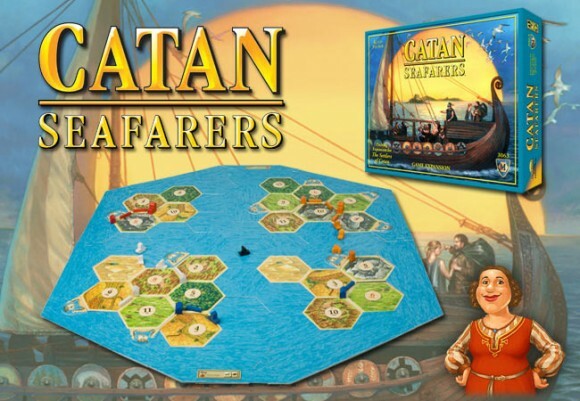 If you haven’t tried Catan with Seafarers, what are you waiting for? Seafarers adds boats, sailing, and a pirate to Settlers. The boats work like roads on the water. They cost a wood and a sheep, raising the relative value of sheep. The pirate works like the robber allowing one to steal from another player. The pirate also block more boats. The game comes with many scenarios so there is even great possibilities for play. Some scenarios add new bonus points, usually for building on an island you did not start on. The biggest help is the larger board makes it harder for a player to be completely blocked in. This expansion makes the game better in every way. While Seafarers takes a little longer to play than basic Settlers, it offers a more varied, slightly better balanced experience. While I recommend Cities & Knights as a first expansion, Seafarers really deserves table time in its own right (not to mention that they completely cross-compatible!). This adds so much to the base game of Catan – just the fact that there are sea tiles and a larger board opens it up for a much wider range of interesting strategies. Seafarers is what every expansion should strive to emulate, adding an interesting twist without taking anything away. Recommended for anyone with Catan. Particularly people who have become bored with the base game. A must have. I have Catan since 1998 and fron the start of the game i wondered why this game has no ships. This expansion give a big depth to the game. The rules are the same and the sheeps now have a bigger perpose for the game. 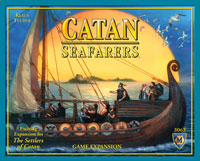 Add a Review for "Catan: Seafarers"